A Bahrain lawmaker says he set fire to an Israeli flag during a parliament session in a show of support for the Palestinians in Gaza. Osama al-Tamimi says he smuggled a canister of gasoline into the chamber and set the flag ablaze Tuesday. The incident prompted a five-minute suspension of the session. Al-Tamimi says he sought to "send a clear message to the international community" about Bahrain's support for the people of Gaza as they face Israeli attacks in retaliation for stepped up rocket strikes by the Palestinian group Hamas. Bahraini authorities have banned pro-Gaza public rallies as part of wider clampdowns against political marches. The country last month outlawed all political gatherings in attempts to quell a 21-month-old Shiite-led uprising against the Sunni monarchy. 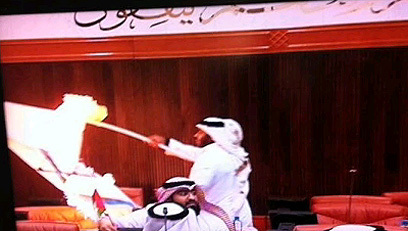 See all talkbacks "Bahrain lawmaker burns Israeli flag in parliament"